Are you ready for the biggest dance party ever? 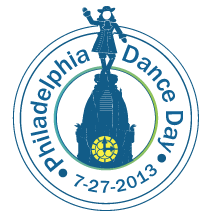 We’ve been busy updating this site with a fresh line-up of workshops for Dance Day 2013 and it is shaping up to be an epic day. We’ve already got more free workshops on deck than ever before – 20 and counting – plus an even bigger evening dance party (with extra fans and AC units to complement the central air)! Check out the schedule and our FAQ pages for everything you need to know, and stay tuned for more announcements as we get closer to July 27!